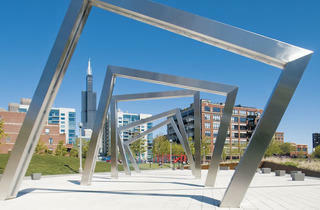 Lay down the picnic blanket at these new Chicago Park District additions. This park is a stone’s throw from the Loop—but it feels a million light years away. 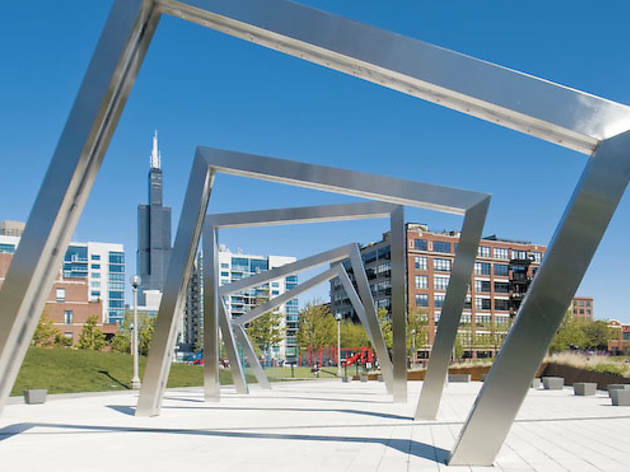 Renovated in 2010, the West Loop spot’s artistic landscaping is a must-see; its most noticeable feature is a sculpture resembling five frames jutting from the ground; in the summer, it sprays a light mist on those who pass under the steel structure. Small, rigidly angled hills (formed over the rubble of the demolished infirmary once occupying the block) are softened with tall native grasses. Architectural elements from the infirmary’s facade add embellishment to walkways—another ode to reuse. The playground takes ADA accessibility up a notch: It offers rubberized surfaces sloping in an array of zigzags—a fun challenge for all kids. A dog area stuffed in the one-square-block park overwhelms a bit—but it’s perfect for the pet-owning condo denizens who occupy the neighborhood. Prime picnic spot Toward the southwest corner, a sunny slope faces the scenic Loop skyline. On weekends, the newly rehabbed playground draws flocks of young parents with wee ones. No worries—there’s plenty of brightly colored equipment to go around. The theme seems to be aquatic: An imagination-spurring dragon tops a sea of rubberized surfaces. For adults: $5 yoga classes take place on Thursdays at 6:30pm. Prime picnic spot Just steps away from the playground, the athletic fields provide a quiet area when games aren’t in session. We’ve been heading to this Bridgeport green space for the last few years, but the Chicago Park District spot officially opened only last summer. The former working limestone quarry features stunning, gurgling wetlands snaked with well-designed walkways. The marshy ground leads down to a pond occupied by ducks and birds and bordered by quarry walls. The whopping 27 acres accommodate kite-flying on the treeless east side, where you’ll also see a smattering of tai-chi practitioners on weekends. Prime picnic spot Stake out a grassy plot near the highest elevation point, marked by a paved circle dotted with limestone rocks.